Keep your eye on the Handel and Haydn Society and its role in Boston's daily life for many years to come! 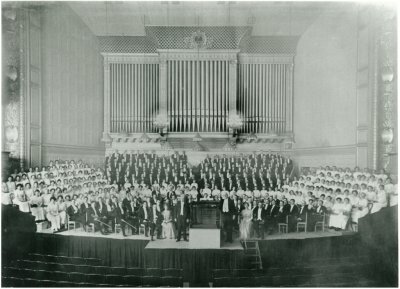 For two centuries, the Handel and Haydn Society in Boston has held a unique place in American music: the not-for-profit organization, founded in 1815 for the modest and relatively confined purpose of “cultivating and improving a correct taste in the performance of sacred music,” has set national and international standards and styles for excellence in classical choral music far beyond the scope or even imagination of its original founders. The Handel and Haydn Society – sometimes called the H + H Society, for contemporaneity’s sake – is celebrating its Bicentennial with a number of special short-term and long-term events and programs. One of these, most recently, was the sponsorship of a Music Critics Association of North America Institute, a two-day long immersion for eleven MCANA members in the current life of the H + H Society. The informative, intelligent and extremely well-organized Institute was conceived primarily by Marie-Helene Bernard, H + H’s Executive Director since 2007, and administered with graceful, quietly effective attention to detail by Matthew Erikson, H + H’s Public Relations and Communications Manager. The MCANA Institute provided opportunities for learning and robust exchanges of insights and ideas; it was an affirmation of the H + H Society’s place in the contemporary world of classical music. Though the purposes of the MCANA Institute were primarily musical, it also provided access to information about the Society’s positive, effective engagement in the cultural life of Boston as a whole. The formal opening of the Institute consisted of leisurely time spent in the Society’s Bicentennial Exhibit at the Boston Public Library with Bernard, Erikson, Harry Christophers, the H + H Society Orchestra Artistic Director, and other H + H staff members. 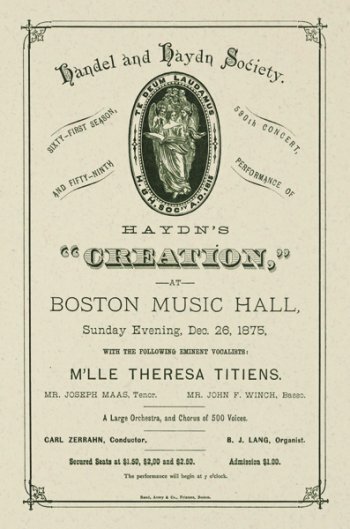 Subsequent MCANA Institute events included two panel presentations, two evening concerts at Boston Symphony Hall, and multiple opportunities for conviviality and conversation among the writers, scholars and critics, H + H officers, supporters, singers, musicians and staff members, as well as Boston Symphony Orchestra administrators. The H + H Society Bicentennial Exhibit, on view until September 5, 2015, is located on the second floor of the magnificent 1895 McKim, Mead and White Boston Public Library. On first glance, the exhibit seems staid and sedate, but, in fact, the historical materials themselves and the exceptionally skillful deployment of modern technology make the exhibit lively and exciting. Display cases contain material arranged chronologically. Two exhibit features – a running timeline of major social, political and cultural events and periodic single-date descriptions of “life-back-then” – enable visitors to locate exhibited items in time and cultural context. Most of the material consists of documents and ephemera: concert programs, letters, photographs, posters, contemporary newspaper clippings, correspondence, scores. The layout of the displays is attractive and clear: a wealth of material is presented without clutter or visual confusion. Highlights of the exhibit focus naturally on particular pieces of music that have been foundational in the history of the Society – works by Handel and Haydn, of course, as well as Bach, Mozart, Verdi and Berlioz, together with more recent and contemporary composers such as H. H. A. Beach, John Knowles Paine, Randall Thompson, Dan Welcher, Tom Vignieri and Silvio Amato – as well as on outstanding H + H musical leaders and conductors. The exhibit extends chronologically from the Society’s founding through to the present day. For H + H Society friends and fans, the exhibit presents a chronological walk through familiar territory with happy stopping points at featured highlights along the way. For more casual visitors – surprised tourists; school groups brought in by energetic, optimistic teachers; restless researchers or neighborhood book borrowers – the exhibit provides a sweeping view of American and Boston history through the particular, and somewhat surprising, lens of a unique classical music organization. The rare challenge, of course, of the H + H Bicentennial Exhibit is that the Society is above all about music. The exhibit would be incomplete without sound. Here, technology proves invaluable. H + H recordings are played in the exhibit room; individual listening stations are located throughout the room; various apps can connect visitors to pieces of H + H musical history even after they’ve left the exhibit. The technology can’t replace either live music or the grand experience of the concert hall … but it’s enough to entice people to seek them out. For MCANA Institute members, an afternoon panel located in the brilliantly frescoed Abbey Room of the Library and focused on the history of the Society followed the morning at the exhibit. Ably and thoughtfully moderated by Jeremy Eichler, chief classical music critic of The Boston Globe, three panelists spoke on the history of the H + H Society, its current outstanding features, and its vision for the future. Author Jan Swafford spoke about the history of the Society in broad strokes, looking at what America was like in 1800, and in 1900, in comparison to the present, and at its overall ups and downs and famous events over two centuries; he highlighted, too, the fact that over the years, the Society has been sometimes the leader and sometimes the follower in major classical musical trends in the United States. H + H Executive Director Marie-Helene Bernard discussed the Society as being “always about the people,” who ask and answer questions such as “How have people come to culture?” in the past as well as the present. Bernard discussed the Society’s change to historically informed performances in 1986, and about how to “reconnect to the early music image while looking forward.” Writer and critic Donald Rosenberg, editor of Emag, the magazine of Early Music America, provided a useful chronological overview and national perspective on musical societies, organizations, associations, orchestras and educational programs within which to locate the H + H Society’s goals and achievements. After a marvelous March 27 evening performance of Bach’s St. Matthew Passion by the H + H Society Orchestra and Chorus, led by Harry Christophers at Boston Symphony Hall, the Institute’s second panel focused on a detailed consideration of issues related to “The Mainstreaming of Early Music: How the Historical Performance Movement Has Impacted Vocal and Orchestral Music in Concerts and Conservatories.” The apparently narrowly specialized topic yielded, in fact, a quite wide-ranging, witty, and thoughtful conversation among the panelists: their discussion of the evolution of the historically informed performance movement over the last quarter century was focused and specific while never losing sight of “big picture” questions for musicians and audiences alike. Led by Wall Street Journal writer Heidi Waleson, three panelists representing a wealth of experiences and expertise in Baroque music history and performance – Judith Malafronte, singer, writer and teacher of Historical Vocal Performance at Yale University; Thomas Forrest Kelly, Morton B. Knafel professor of music at Harvard University; Jesse Irons, H + H violinist – discussed their topic with evident zest and delight. The conversation began with a ruefully nostalgic look at the era when Baroque music performances on period instruments were as countercultural as granola, folk-dancing and Birkenstocks, and when early recorder players could perceive themselves as part of a wider musical democracy; panelists then considered the gradual migration of what is now fairly familiar and unseditiously mainstreamed historically informed Baroque music into contemporary music programs and conservatories. Authenticity in the sense of accurate replication of historical sound is impossible, and now, some three decades after the historically informed performance movement first took hold, most scholars and musicians agree that accurate replication is not actually a reasonable or sensible goal. Instead, the creation of music that can recall or evoke composers’ intentions, offering listeners fresh or timeless meaning and beauty, is what more truly and effectively constitutes musical authenticity … and artistic integrity. These qualities have been and will continue to be important reasons for H + H Society supporters’ loyalty: musical excellence – currently and for the foreseeable future grounded in a commitment to historically informed performances – will carry the Society into the future as both a musical institution and a cultural, creative arts organization. But the long-range health and vitality of the Society as an institution will depend not just on fine music, but, in addition, on the evolution and development of its relationship with Boston: city and Society must confront the dynamic complexities of the twenty-first century in partnership, a project already securely in place. In one form or another, the H + H has been a significant, public and visible part of Boston’s cultural life since its founding. In addition to packed and popular concert seasons, H + H concerts have ushered in the Christmas season, celebrated peace after wars and led Boston in the music of mourning after the deaths of Lincoln, Roosevelt, Kennedy, and the victims of the 9/11 terror attacks. Currently, small H + H ensembles perform in venues all over Boston and Bicentennial celebrations will include a free summer time outdoor performance of Beethoven’s Symphony No. 9. Equally and increasingly important, the Society’s wide variety of education and community outreach programs have direct and tangible, positive impacts on the cultural and social life of Boston. 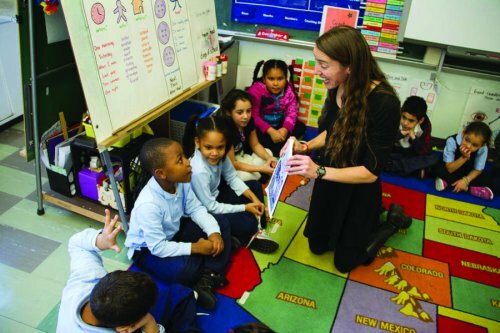 Multiple educational initiatives comprise the Karen S. and George C. Levy Education Program, first formally organized in 1985. Young children, ages 8-11, can participate in H + H Singers. The Youth Chorus for girls and “boys of unchanged voices” was founded in 1994; the Young Women’s Chorus was founded in 1998, and the Young Men’s Chorus in 2006. The High School Soloists program, established in 1994, is a “pre-professional vocal training program for students who wish to pursue careers in opera and music education.” The newest youth ensemble at the Society is the Young Women’s Chamber Choir; their first performance took place in 2013. In all these groups, children and young people are given regular opportunities for public performance of a rich and varied musical repertoire in a wide variety of venues. Unlike the New England Conservatory students, the younger children and adolescents may or may not go on to professional lives in music, but their exposure to disciplined, rigorous rehearsals and joyful performance will enable them to recognize discipline, joy and excellence when they encounter them in both musical and non-musical circumstances. Over the last two and a half decades, the H + H Society’s development of these innovative and influential programs – now representing close to $400,000 of the Society’s $4.3 million budget – demonstrates foresight in terms of both national musical leadership and cultural civic engagement. Continued success in these programs will ensure the security of the Society’s future and reinforce the vigorous, mutually beneficial relationship of the Society and the city. An elegant record of the history, musical and civic achievements of the H + H Society, and its vision for the future is contained in the fine book published in conjunction with the Bicentennial. The Handel and Haydn Society: Bringing Music to Life for 200 Years (David Godine, publ., 2014) (www.godine.com) is a handsome picture book; it is also a thoughtful and detailed analytical history of the Society, managing a deft balance of popular accessibility on the one hand and annotated scholarliness on the other. The book is organized in chapters – essentially self-contained essays – that alternate chronological accounts and thematic examinations; the chapter authors – Jan Swafford (one of the MCANA Institute panelists), Michael Broyles, Matthew Guerrieri, Teresa Neff, Steven Ledbetter, Donald Teeters and Thomas Forrest Kelly (also an Institute panelist) – each wrote clearly and engagingly about their particular areas of expertise. Three appendices (H + H Premieres and Commissions; H + H Recordings; H + H Leadership) will provide useful reference material for historians, reviewers and critics for many years to come. Images in the book include many of the materials displayed in the Bicentennial exhibit; these are interspersed with images from events that took place as recently as 2012 and 2013. Text and pictures together reinforce the core message of the Bicentennial: the Society’s past strengths inform both the present and its goals for the future. Two themes bind together both the Bicentennial celebrations and the H + H Society’s always evolving sense of its own identity. The first theme involves the constantly changing relationship between the old and the new: old composers and new … then and now; old leadership, old guard and new leadership, new blood … over time; new is next … but everything old becomes new again; which old things must be renewed, and which new things must be allowed to drift into the forgotten territory of the old? Some of these tensions are contained exclusively within the Society itself; others reflect the many musical and civic communities of which the Society is a part. The second more subtle and complex theme involves the people of the Society in relation to issues of class and ethnicity within the context of Boston’s population and demographic shifts. For most of its history, the H + H has been maintained by the energies and enthusiasms of the European descended Bostonian middle class and by the funds of its upper class. But Boston is now a multiethnic, international American city in a global twenty-first century economy. The financial and administrative future of the Society will depend not merely on the happy maintenance of its traditional resources but also on its ability to cultivate new resources and allegiances by forging new relationships with the diverse communities of the city. If the Society’s future is to be genuinely dynamic rather than anachronistic, the continued growth and innovation of its educational and community outreach programs are critical. The creative arts in general enrich all our lives; for some of us, music is especially important. But it is not just the music that H + H contributes to the city: it is the Society’s ability to make Boston’s students and young people better and more productive people as they mature: it is the Society’s commitment to engaging students in integrity that equips them for competent citizenship. Training in excellence in one field – choral music – enables students to recognize and value excellence in all fields. Similarly, practice and comfort in collaborative processes such as musical rehearsal and performance give young people skills in cooperation, group processes and collaboration that will serve them well in any project or profession. The H + H’s capacity to teach these values and to see them instilled and disseminated in Boston’s diverse communities is as important to both the Society and Boston as is the continued creation of beautiful and important music, both old and new. If, in its third century, the Handel and Haydn Society can indeed achieve these complex, important goals, then every promise for the Society’s future contained in its Bicentennial celebrations will be fulfilled. Keep your eye on the Handel and Haydn Society and its role in Boston’s daily life for many years to come! Note: All information and direct quotations come from the H + H Society website (www.handelandhaydn.org) or from participants in the Music Critics Association of North America Institute (Boston, March 26-28, 2015) (www.mcana.org). 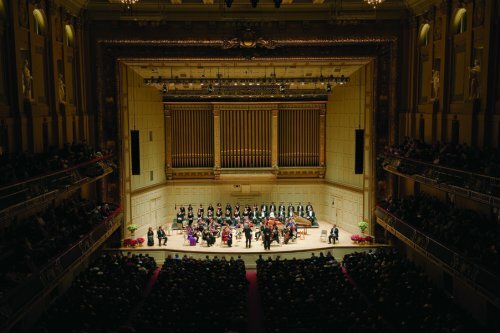 A beautifully performed work of genius highlights Boston's unique place in American and international classical music performance. In a packed, busy Festival, several particularly marvelous new works emerged. A ravishing, splendid performance of a Baroque masterpiece in a setting of ancient Mediterranean architecture.